Definition: When the data are collected directly by the researcher for the first time is called as Primary Data. It is original in nature and is specific to a research problem under study. 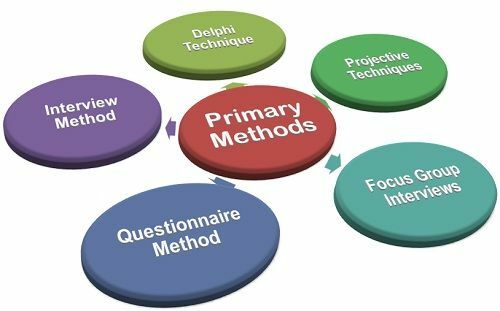 Interview Method: It is the most widely used primary data collection methods wherein the interviewer asks questions either personally, or through mail or telephone from the respondents to obtain the insights of the problem under study. The researcher may either visit the respondent in person at his home or meet him at the central location as mutually decided by them. And in case, a large group of respondents is to be contacted then the mail and telephone survey can be used. In the mail survey, the questionnaires are sent to the respondent who is expected to give answers to the questions via mail. In the case of a telephone survey, the interviewees are called and asked questions (closed-ended) specific to the research problem. Delphi Technique: It is a forecasting technique wherein the researcher elicits the information from the panel of experts either personally or through a questionnaire sent through the mail. Here, each expert in his respective field is asked to give their opinions on the problem concerned and the consolidated view of all is used to reach for the most accurate answer. Thematic Apperception Test (TAT): Here the respondent is presented with multiple pictures and then is asked to describe what he think the pictures represent. Role Playing: Under this method, the respondents are given the imaginary situations and are asked to enact in a way they would have if the situation is real. Cartoon Completion: Here the respondents are shown the cartoon pictures comprising of two or more characters and then are asked to give their ideas and opinions about the characters. Word Association: Here the researcher provides a set of words to the respondent and then ask them to tell what comes to their mind when they hear a particular word. Sentence Completion: The researcher provides the incomplete sentences to the respondents and asks them to complete it. This is done to check the ideas of the respondents. Focus Group Interview: It is one of the widely used data collection methods wherein a small group of people, usually 6-12 members come together to discuss the common areas of the problem. Here each individual is required to provide his insights on the issue concerned and reach to a unanimous decision. In this interview, there is a moderator who regulates the discussion among the group members. Questionnaire Method: Questionnaire is the most evident method of data collection, which is comprised of a set of questions related to the research problem. This method is very convenient in case the data are to be collected from the diverse population. It mainly includes the printed set of questions, either open-ended or closed-ended, which the respondents are required to answer on the basis of their knowledge and experience with the issue concerned. Note: It is to be noted that these primary data collection methods can be used to collect both the qualitative and quantitative data.